This changes because I work across our 14 offices. My job is very “meeting based” and I spend a lot of time travelling to visit clients at their premises as well as supporting teams in any one of our offices. However, I cannot stand the underground so most of my London meetings start at 9.30am to I make sure I miss rush hour. Incredibly varied, as a company we provide business services across the whole of the UK and to do this we have specialist divisions focused on certain sectors. One day I can be discussing production planning and modelling and the next day fundraising and charity-based accounting. I get to work with a complete range of people and am fortunate to be exposed to a large mix of the diverse businesses we have in the UK. Yes. As a business we are continually looking to evolve and find new ways to help our customers and prospective customers. This is very sales and marketing-led; therefore a large part of my role is to be creative in how we market ourselves to gain a competitive edge and more market share. Nowadays, I spend the majority of my time in meetings. Also, because 150 of our 700-strong workforce are sales and marketing focused a lot of my time is spent supporting and working with people to create an environment for success. I used to, but I don’t have a desk anymore. The obligatory picture of me on a boat with my family used to adorn my desk, now we have open-plan offices and I hot desk. I like to think so, not creative in a design way, but I am creative in a strategic sense. You need the ability to ‘think outside the box’ to evolve business, adapt to change and maintain an economy of scale. In three years we have seen double-digit organic growth. I have therefore had to continually change the way we operate and how we present ourselves in order to respond to change and stay ahead of the game – you must have some degree of creativity to do that. Years ago I sold finance software to UK businesses. In 2001 I went to a company that owned a chain of perfume shops and tried to sell them an accounting system. They didn’t have the budget so instead the owner started telling me about his business and the link between a person’s fragrance and their success at work. I am easy to sell to and so ended up leaving with a £30 bottle (much more nowadays) of Giorgio Armani aqua di gio. I then had an exceptional sales year and from that day on I have never had a day at work without wearing it. I cannot estimate how much of the stuff I have bought, but it is only worn for work, not weekends or evenings. It’s become my talisman. Weird hey?! Very much with colleagues and I love it. I would hate to have a role where I am largely on my own, interaction is really important for me. Too many if you ask my wife. The ability to work remotely and having access to a mobile has really extended the working day. 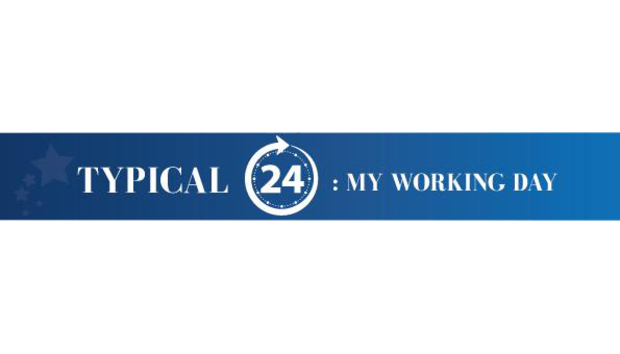 That doesn’t mean I’m a workaholic but I do what is necessary to get the best results for the company and clients and am extremely lucky to love what I do. When you enjoy something you don’t count the hours. 85 per cent of my time is spent in meetings and the balance is spent equally on emails, calls and reports. I really try to not let email rule me; it’s a constant battle though. Yes, I am very active on LinkedIn and Twitter. There’s a real sense of community within the business and social media is part of that. Facebook is really popular personally with everyone and on Twitter we have very much embraced the hashtag #thisisaccess, which is used to encapsulate all the things that represent us. The diverse clients we work with coupled with best in class products makes it an exciting place to be. Being at the heart of a fast growing business is really exciting. I don’t listen to music at work. I actually find headphones a bit anti-social. I spend far too much money in Pret or Eat!! And too often it’s on the go. Very much so, from golf trips in Portugal to beers down the pub, this is one of the great perks of working at Access. The social aspect makes the whole place a great environment to be in. When work colleagues are friends as well you enjoy it much more. I am group sales and marketing director but for a period of about six months I took direct control of the marketing department whilst I was searching for a new marketing director. Having to directly manage a team of quality marketeers who needed full time management and assistance from an experienced marketing director was rather full on. So, the day my new marketing director joined I was in seventh heaven! It doesn’t always happen, but reading a bed time story to my daughter is what I love being the last task of my day. I have a road bike and love to head out for a good cycle. However I also like a sociable drink and therefore often undo a great cycle ride with a trip to the pub, because I’ve earned it of course! This is a bad habit that I am trying to nip in the bud. At present yes, however I have a rule that if I get home prior to my daughter’s bedtime I will not check work emails until after she has gone to bed. Protecting those precious times is very important. Not necessarily, but I often take work challenges home with me. I care about what I do and the performance that we aim to achieve, so naturally I cannot just switch off. I have often looked at certain decisions I have made and with hindsight asked myself, why did you did that? However, I can comfortably say that at the time of making them that it was the right decision based on what I knew then, so I don’t feel that I would say anything to alter the course of my life. I would just remind myself that I need to be a nice person in whatever I do and be considerate. You can probably read into that! Ski instructor. I love skiing and think it would be the best job. Not a care in the world other than which run to take next and where to have a beer at the end of the day. No, my work device is used for both personal and work.